From the beginning of the drive to play 5, we see the punt probabilities steadily dropping and the TD/FG probabilities consistently increasing. In these first 4 plays, Brees had 3 completions all over 10 yards, all for first downs. Then, after 2 incompletions, the Saints were stuck in a 3rd-and-10 from their own 46. Brees drops back and hits his tight end, Jimmy Graham, for 28 yards. On top of that, Danieal Manning tacks on another 15 yards for a personal foul. Punt probability drops from 57.7% to essentially 0% and TD probability jumps from a mere 13.5% to 52.5%. In addition, field goal probability triples from 10.0% to 32.8%. On the very next play, the Saints run the ball for the first time on the drive (and first time in their previous 14-plays). Ingram scampers for 13-yards and the Saints convert the two-point conversion to go ahead 40-33. We see the same trends. The EP slowly increase until play 5, dipping to 1.24 points on the 3rd-and-10. 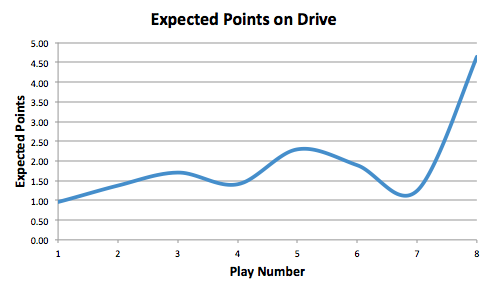 After the deep completion and Manning penalty, expected points on the drive jumps to 4.64. It should be mentioned, however, that this model does have some limits. Given that the Saints were losing late in the game, there is the possibility that the Saints never would have decided to punt should they have been forced to make a decision. That being said, it gives us a good idea of New Orleans' chances of scoring a go-ahead field goal or touchdown, especially after beginning the drive on their own 7-yardline. 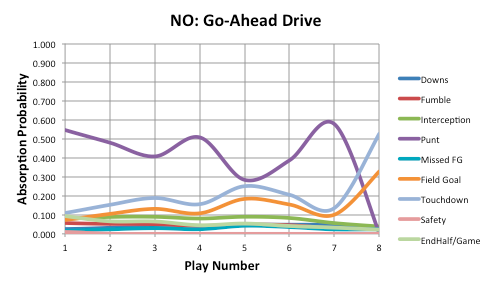 You know, I really like your Markov model, but without considering the score and time remaining, it's really the wrong tool for analyzing 4th quarter game-winning drives.